Nearly two years after a horrific murder in Fort Washington, Maryland, the man charged with killing his 2-year-old daughter and her mother is going on trial. Prince George's County State's Attorney Angela Alsobrooks will prosecute the trial personally, News4's Scott MacFarlane reports. This will be the second time in her term as state's attorney that Alsobrooks will lead the prosecution. Daron Boswell-Johnson is facing two counts of murder and use of a firearm during a crime of violence in the deaths of NeShante Davis and their daughter, Chloe. "To kill your own child is an unspeakable and unthinkable crime," Alsobrooks said after Boswell-Johnson's indictment in 2016. Davis was putting her daughter into a car seat on Feb. 2, 2016, when Boswell-Johnson approached her outside her apartment and demanded she drop her ongoing child support order, court documents say. Boswell-Johnson then shot the mother and daughter multiple times. Boswell-Johnson later confessed to the murders, telling police he was angry about being ordered to pay $600 a month in child support after a paternity test determined he was Chloe's father. "To kill your own child is an unspeakable and unthinkable crime," Alsobrooks said. "We will prosecute this case aggressively to ensure that Mr. Johnson is held fully accountable for his actions." Boswell-Johnson's attorney did not respond to requests for comment. The trial will begin Monday, Jan. 22. 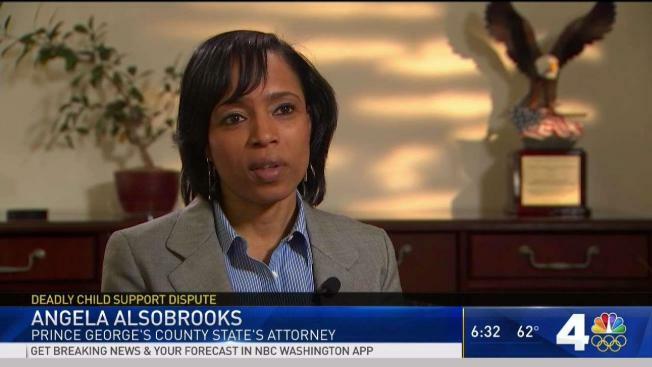 Alsobrooks is nearing the end of her second term as state's attorney and announced in July that she would be running for county executive, The Washington Post reports.